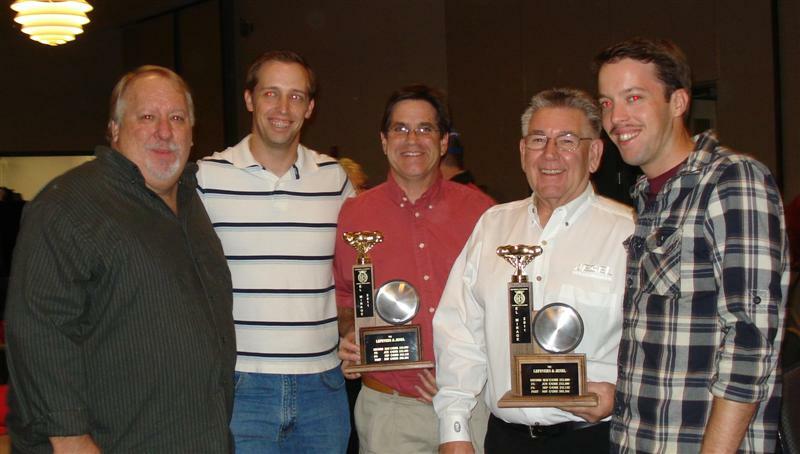 Well the 2011 land speed racing season started off with a bang for us this year. 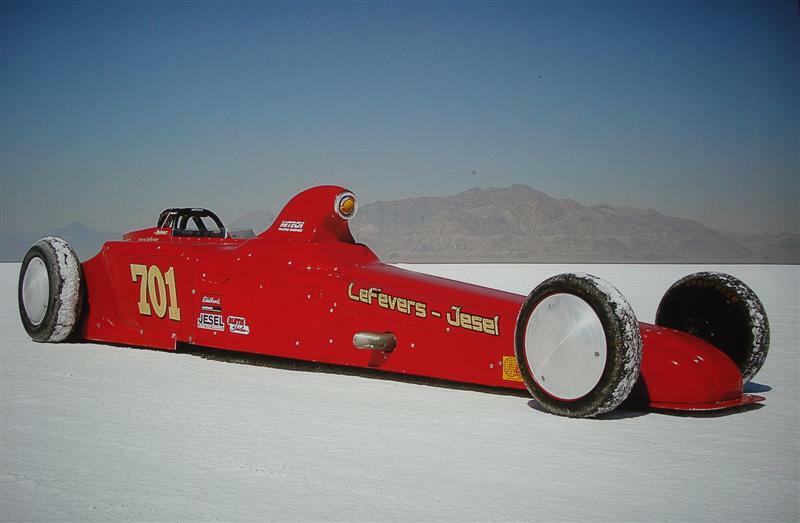 Kevin LeFevers set a record at the opening El Mirage meet in May! The new record speed of 213.609 topped the old record of 208 by over 5 mph! This pass also got Kevin into the El Mirage “Dirty 2” club. 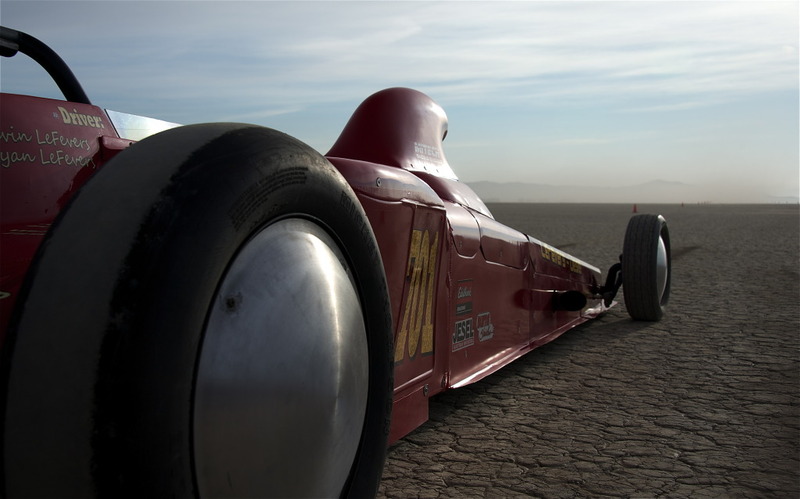 The team came back to the dry lake bed in June to see if they could up their new record but only managed a best speed of 212 mph. 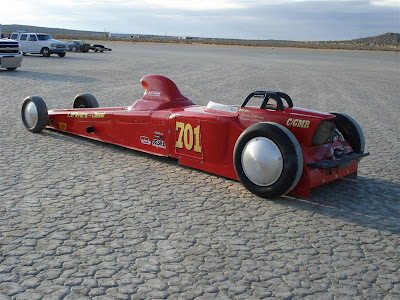 The July meet was rained out so preparations were made to reconfigure the car for Bonneville Speed Week in August. 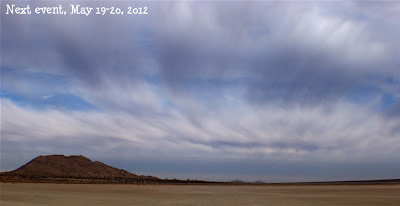 Bonneville was a mixed bag as we had a major storm on Sunday leaving a bit of a mushy course for the next couple of days. We also had problems of our own as first the ignition system failed then after fixing that the fuel system started giving us fits. We finally got the car running decent and both brothers made their best runs ever on the salt. First Ryan ran 230 mph shutting off in the middle mile and then Kevin managed a best top speed of 235 mph after a bit more work on the tune up. Back to El Mirage for the September meet and another 212 mph run. However this was the fastest speed for this meet earning us a top time trophy so we were pretty stoked about that. In October the team decided to focus on trying to get Ryan into the El Mirage 200 mph club by making him the primary driver, as the boy’s normally share driving duties. At this point in the season we had moved up to a high for us of 12th place in SCTA points. That was the good news. The bad news was there was no breeze that morning so we had a lot of “hanging dust” after a car made a pass. This is compounded by the sun moving more towards the center of the course as the month’s progress during the season shinning almost directly in the driver’s eyes on these early morning runs. As a result Ryan realized he was outside the timing traps at about three quarters of the way down course because he just couldn’t see. So he pulled the parachute and missed getting a time or any points for this meet. The last meet of the year saw some improvement in Ryan’s speed as he managed to eclipse the magic 200 mph barrier on the dirt for the first time with a best pass for the weekend of 203 mph. The end result to our season was Kevin entering the El Mirage 200 mph Club, setting top time of the meet in September, Ryan exceeded 200mph on the dirt, and we also won the LSR club points championship. Roush Yates Engines On The Pole At Daytona! DAYTONA BEACH, FL – Just a few short weeks ago, I reported that Roush Yates engines dominated at the Rolex 24 Hour. Well, they are dominating again at the beach! 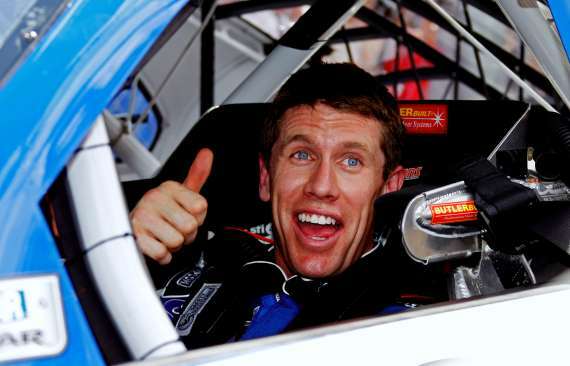 Carl Edwards and Greg Biffle have qualified on the front row for the Daytona 500 making the folks at Roush Fenway Racing and Roush Yates Engines quite happy. Carl Edwards must also feel a sense of revenge after having Tony Stewart edge him out of the Championship last year on a tie-breaker. 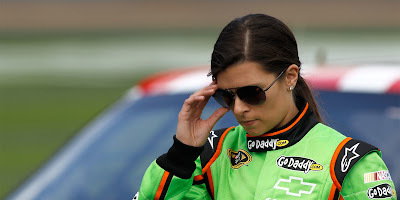 The RFR drivers have the only two spots set at this point in the Daytona line-up. The rest of the field will be determined by the Duel 150 qualifying races on Thursday. Edwards’ best lap averaged 194.738 mph while Biffle ran a 194.087 mph lap around the 2.5-mile oval. "This is a very, very speedy Fastenal [Ford] Fusion, and I appreciate [crew chief] Bob Osborne and all the work he's done," Edwards said. 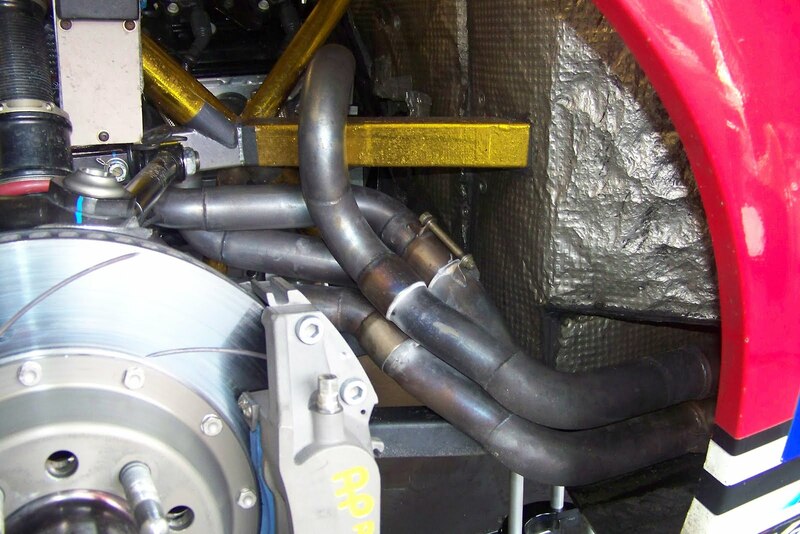 "[Engine builder] Doug Yates -- the engines are so important in this.” Burns Stainless is please to provide exhaust components to the Roush-Yates teams. 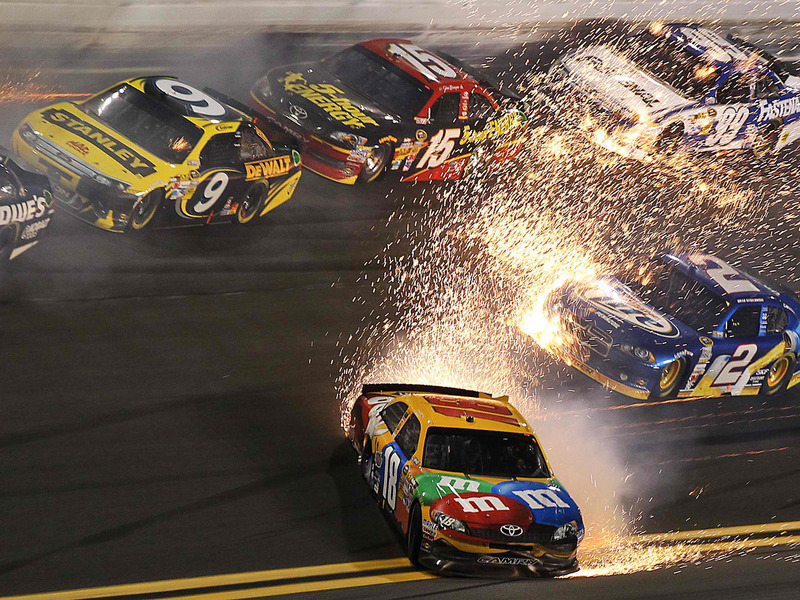 Sunday’s Budweiser Shootout ended poorly for Jeff Gordon who with only two laps to go made contact with Shootout winner Kyle Busch resulting in an eight-car crash (SEE VIDEO) that took him and other out of contention. After Gordon made contact with the 18 car, he hit the outside wall hard, slid onto the apron on his side then flipped three times. Gordon miraculously escaped with minor injuries including a stiff-neck, banged shin, and a cut on his finger. Gordon said that the wreck was due to an aggressive move on his part trying to push Busch too hard. "This is one of the things you're going to see a lot more from me this year. 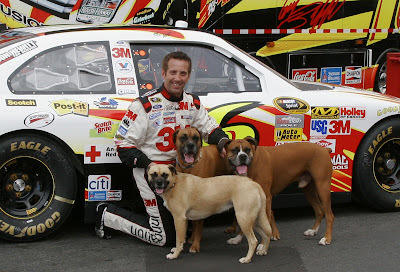 We're going to be aggressive," said Gordon, who won three times in 2011. "I've got an awesome race team, and a car capable of winning races, and I felt like we should have won more races last year than we did. I don't want to let those opportunities slip away, and I feel like we're going to try to make some opportunities as well." Daytona Beach, FL – Ford wins it 1-2-3 at the 50th Daytona 24 hour! In an amazing 24 hour race, The Ford/Rileys powered by Burns Stainless customer Roush-Yates Engines finished 1, 2 and 3 ending a winless streak for Ford. This was also the first win by the Michael Shank Racing team. 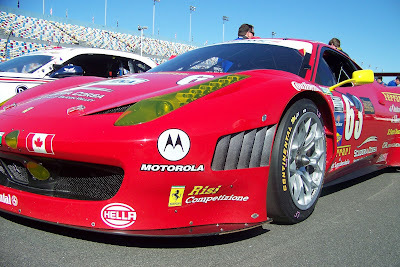 There were high hopes for the Daytona Prototype Corvettes that debuted at the race, but gremlins began appearing early in the race resulting in the Sun Trust Corvette retiring within the first few laps of the race. There was also much speculation that Gainsco DP Corvette with Alex Gurney at the wheel might win the race. His father Dan won the inaugural race 50 years ago in a Type-19 Lotus, crossing the finishline powered only by his starter motor. It would have been a fitting tribute to his father. Alex led the race briefly after the first hour. Shortly after the 6-hour mark, there was a tough battle between Gurney and the DP Corvette dubbed “The Spirit of Daytona,” driven by Oliver Gavin. For several laps, Gurney gave chase to Gavin but a coolant system failure required Gurney to pit resulting in a short stint in the garage and a loss of 4-laps. 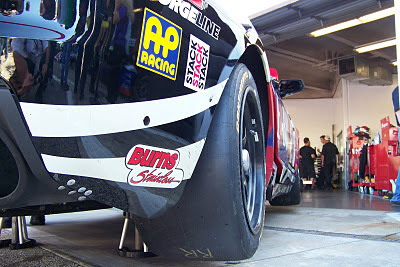 A short time later, AJ Allmendinger mounted a more successful assault on the first place Corvette. Pressure by Allmendinger resulted in a mistake by Gavin allowing the Ford/Riley around. 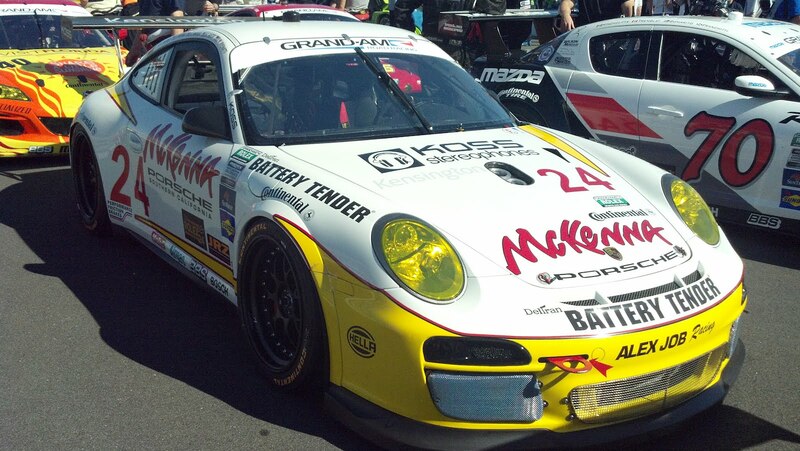 The GT-class also resulted in a 1-2-3 sweep for the mighty GT3R Porsches. The #44 Magnus Racing GT3 piloted by Lally/Lietz/Potter/Rast claimed first place followed by the #67 TRG Porsche. Third place was had by the #59 Brumos Porsche with none other than Hurley Haywood at the wheel. The highest place non-Porsche in GT-class was the Stevenson Camaro GTR powered by a Katech-built LS-engine equipped with Burns-designed Tri-Y headers and collectors. 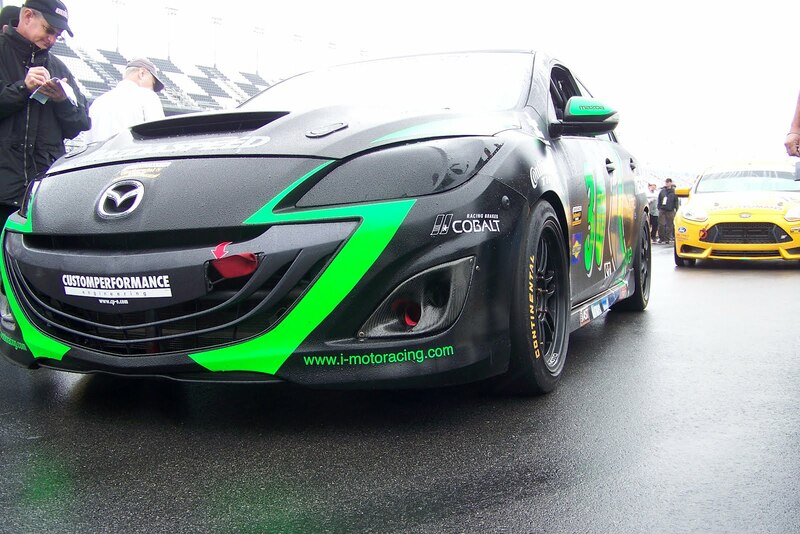 The Daytona 24 Hour race is quite a spectacle. When I first arrived at the track, I was overwhelmed by the sheer scale of the place. 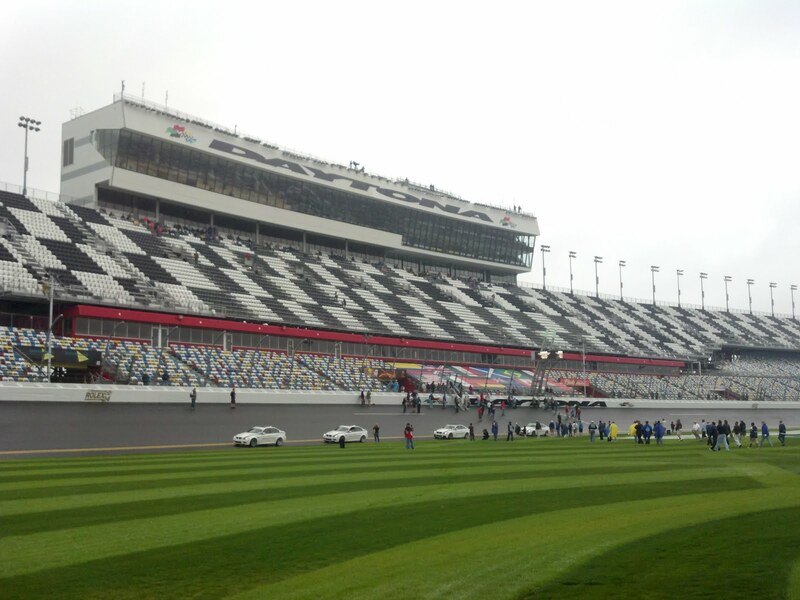 Though not my first visit to a super-speedway, I was still overwhelmed. Not only was I taken by the immensity of the place, the infield was like a circus – ferris-wheel and all. There were car corrals for Corvettes, Porsches, Minis, Mercedes. There were vendors selling everything from cigars to racing paraphenelia to funnel cakes and tequila. Nissan, Porsche and Chevrolet were there with big car displays. In the Fan Zone there was a large stage with a rock band playing to a large crowd. There were pretty girls all over. Some were giving out NOS drinks and the girls at the Continental Tire display were there to take a picture with you. I finally made my way to the holy-of-holies, the garages. I first came upon the Daytona Prototype garages with the teams scrambling all over the cars getting them ready for the race. 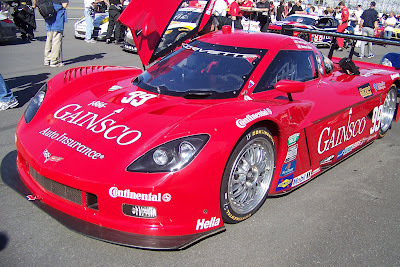 The Gainsco Corvette in its bright red paint scheme was quite stunning. You could tell that all things were not well at the Sun Trust Corvette garage as the engine was being removed and replaced and I could over-hear team members recounting the various issues with the car. The Roush Yates Engine technicians were putting the final touches on the Ford/Rileys of the Michael Shank Racing team. Moving past the DP garages were the GT-class BMWs of Turner Racing. The bright yellow and blue paint schemes were quite noticeable. Then there was a sea of Porsches as far as the eye could see. 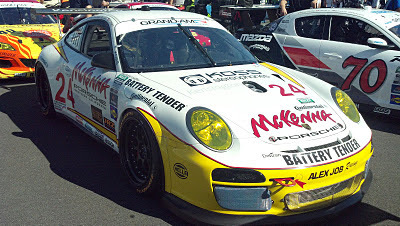 The German marquee was well represented with 24 entered in the Rolex and 5 in the Continental Tire 200. Moving further through the garages I came upon the beautiful 458 Italias. Though they did not place well in the race (13th in the Rolex), there is something moving about the sumptuous low-slung Italian bodywork. Daytona was also the North American debut of the Audi R8 race cars. 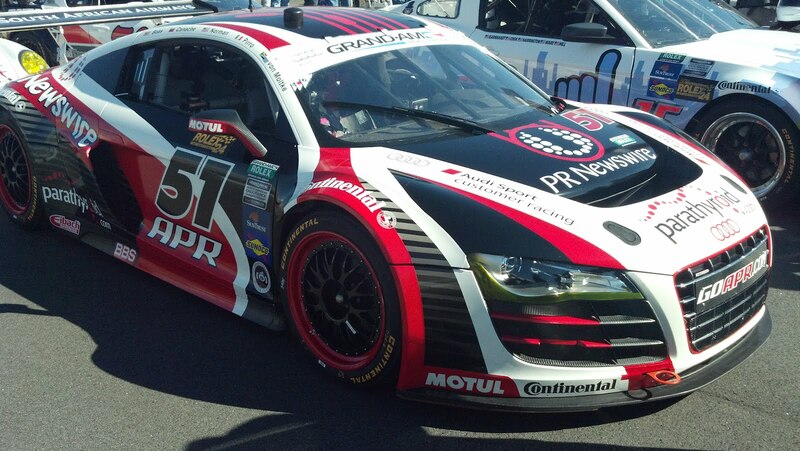 The Audis looked very purposeful. The simple yet elegant racecars looked like they were there to conquer. The #51 APR entry was only able to complete 447 laps but you can bet that the company that campaigned the mighty TDIs and built a temporary 100-room hotel to house their team at Le Mans will be back in strength. The first race of the weekend was the GRAND-AM Continental Tire 200. The Continental Tire Sports Car Challenge features sports cars manufactured from around the world, brought straight from the showroom floor, that race side by side with only minor modifications in the area of safety. Like the GRAND-AM Rolex Series, the Continental Tire Sports Car Challenge races two classes at the same time: Grand Sport (GS) and Street Tuner (ST). The overall winner of the race was the Roush Performance Mustang Boss 302R GT co-driven by none other than Jack Roush Jr. The ST-class was won by the iMoto Racing MazdaSpeed 3 driven by Clunie / Kleinubing and equipped with a Burns Stainless sourced exhaust including Ultralight Racing mufflers. After the sun goes down, the infield circus transforms into Las Vegas. People dancing, drinking and watching the cars. Patron Tequila has a large bar setup in the infield serving drinks up until 25-laps from the finish. There are campfires all over. It is interesting to note that with the efficiency of the modern race cars the smell of unburned fuel in the exhaust is overcome by the smoky campfire smoke. There is really just too much to write about concerning this race. It is certainly one of the most important races in the world, and is a very unique experience. If you haven’t been, you need to go!